The Philippines has submitted evidence to a UN tribunal hearing its case against China's territorial claims in the South China Sea. Both sides have overlapping claims in the sea, leading to severe tensions. China has refused to take part in the arbitration and warned that the case will damage bilateral ties. The latest move comes a day after a Philippine ship evaded Chinese vessels to bring supplies to troops stationed on a disputed shoal. China claims a U-shaped swathe of the South China Sea - creating multiple overlaps with areas claimed by the Philippines, Vietnam, Brunei, Malaysia and Taiwan. The Philippines says that China's claims are illegal under the United Nations Convention on the Law of the Sea. In January, the Philippines asked the UN's Permanent Court of Arbitration to consider its case. It is thought that the court may not reach a decision before the end of 2015. 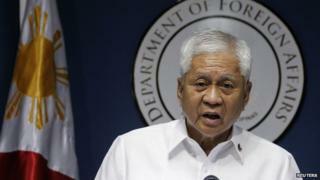 Speaking to reporters on Sunday, Philippine Foreign Secretary Albert del Rosario said that more than 40 maps and "nearly 4,000 pages" of evidence had been submitted to the tribunal. "It is about defending what is legitimately ours... it is about guaranteeing freedom of navigation for all nations," he said, adding that it would help "preserve regional peace, security and stability". Chinese Foreign Ministry spokesman Hong Lei said last week that China would not accept the arbitration, and that the Philippines should "stop going any further down the wrong track so as to avoid further damage to bilateral relations". China was "committed to managing and resolving relevant issues... through dialogue and consultation," he added. On Saturday, a Philippine government ship slipped past Chinese coast guard vessels to reach the disputed Second Thomas Shoal, known as Ayungin in Manila and Ren'ai Reef in Beijing. Philippine troops are stationed on a beached, rusting military ship that analysts say has become a symbol of the country marking its territory. On 9 March, China prevented two Philippine vessels from reaching the shoal. Philippine officials said the ships carried supplies for the troops on the shoal, but China said the ships carried construction supplies. Following the incident, Philippine planes air dropped supplies onto the shoal.